Google Glass has been unleashed now for several months. Volunteer researchers are trying them out and developing a range of apps for them. Up until now I’ve only seen photos of people wearing them but last week there were several attendees wearing cool colored ones at the SIGCHI conference I was at in Toronto. It can be slightly unnerving when in their company as they look up and to the right to view what is on the glass screen rather than at you and into your eyes. As a result you might see more of the whites of their eyes than the usual interested dilated pupils. It could be the end of eye contact as we know it. Meanwhile, there has been much debate in the press about the latest developments in facial recognition. 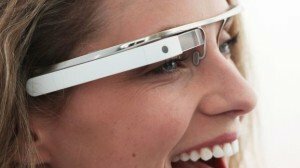 NameTag, for example, is an app developed for Google Glass that takes a picture of the person you are talking with and then checks their online profile, providing a cloud of personal information about them, presumably mined from Facebook and other social media apps. So, you can find out more about someone on the go while talking to them – for example, what music they like, what films they have just seen, where they have just been on vacation, and so on – all in a digestible précis with a halo of photos around to boot. One could imagine that if this way of meeting up with others actually takes off, we may find ourselves in the situation where we wont need to talk to each other anymore. Just as text messaging has largely taken over from making phone calls for many people, ‘cloud talk’ could start taking over our initial encounters with people when we meet them at parties, at conferences, on trains etc. We might nod and smile in acknowledgement of each other but we wont ever have to have those awkward conversations anymore. A panacea for the shy? But how will we know what each other is looking at? You might think I am reading your blog or tweets when in your presence but really I might just be watching the latest updates of the football results and pretending to ‘meet you’. Perhaps a more creepy development is the installation of cameras in bars in the US that are starting to use facial recognition. 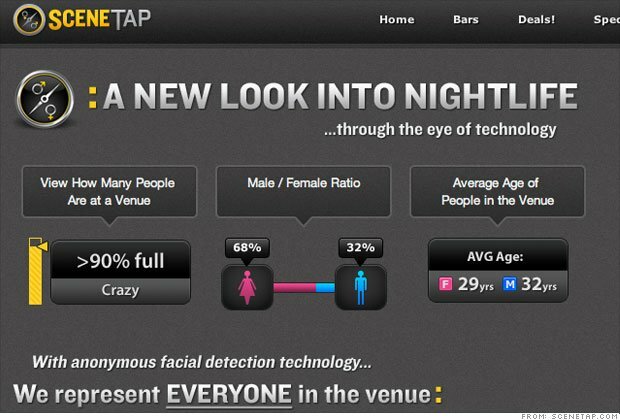 SceneTap, for example, uses it to provide information about the age and gender of people already in a bar to help others decide whether it has the right kind of people in it that they want to drop in. The thin edge of the digital voyeurism wedge? At the conference I was at some of my researchers attended a hackathon where, with a team of others, they set up a hoax service called the quantifiedtoilets.com giving a new twist to surveillance in public places. They placed signs up in the restrooms in the convention centre we were at saying they were capturing toilet behaviour for real-time data and health analysis. They claimed furthermore to be working with local businesses, building owners, and local officials to improve the health and efficiency of individual buildings, neighborhoods, and entire cities. To achieve this, they purported to be analyzing “the biological waste process of buildings to make better spaces and happier people. We use this data to streamline cleaning crew schedules, inform municipalities of the usage of resources, and help buildings and cities plan for healthier and happier citizens.” The data they collected from each individual toilet , which they then revealed as stats for each toilet in the building, included the amount deposited, the odor, blood alcohol level, and any drugs, infections and even pregnancy detected. For example, a fresh urine deposit in the far end toilet on the 7th floor might have revealed that a recent occupant was female, had a blood alcohol level of 0.3% and was pregnant. Not surprisingly, lots of people tweeted and blogged about this latest development. Many took it at face value and were shocked and outraged at such an invasion of public privacy. Which is what the researchers were interested in. There was also lots of coverage in the press, including Wired, the Washington Post and the Atlantic. It was only later that it dawned on people that it was a hoax – a thought experiment intended to get people to debate. And it surely did. But do keep an eye on those advanced Japanese toilets that already have a set of mindboggling functions. You never know, they might just start adding a few more sensors and a webcam in the bowl.